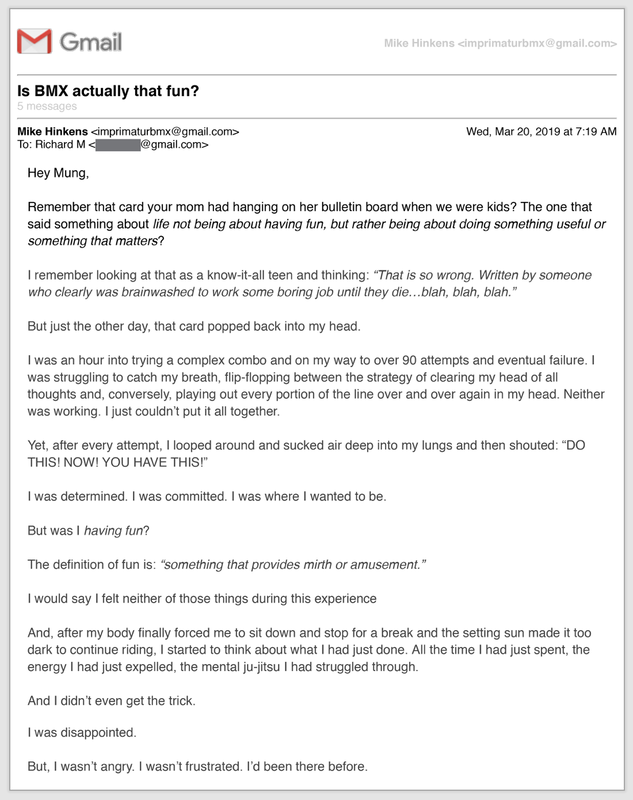 Synopsis: Fun is often seen as one of the primary goals of riding BMX, but in the following email conversation between Richard Mungall and Mike Hinkens they discuss the nuances in the motivations for riding BMX that they have seen develop over the years by thinking about: what exactly is "fun," how the idea of "fun" changes in BMX over time, and how this all applies to life more broadly. Synopsis: The "street riding" focused nature of today's BMX culture is quite obvious in many aspects, but also quite bemoaned by some riders. In this piece, the author explains why that has come to be as well as how "street" may no longer be as dominant as it appears. Understanding the complex reasons BMX looks as it does today can help us to understand our present state as well as the future of BMX as a whole. or scroll to bottom after the jump to listen. 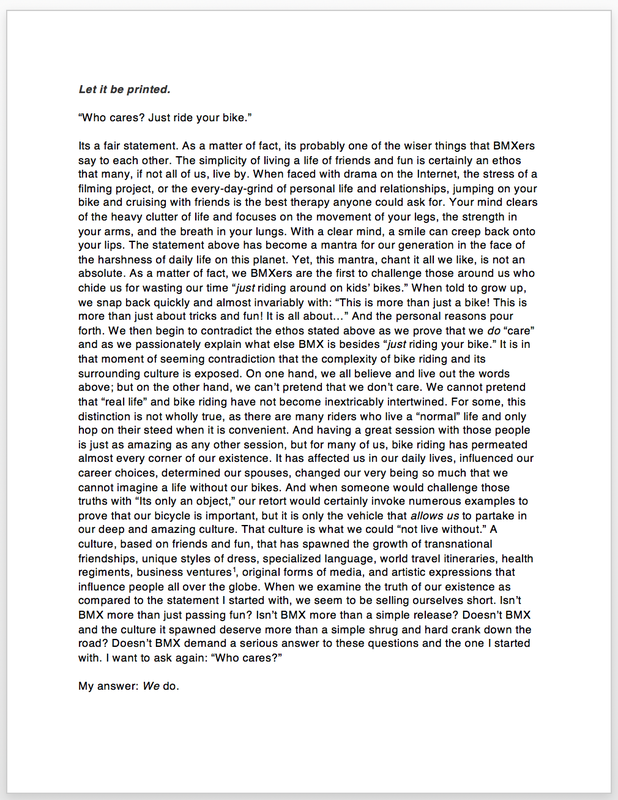 Synopsis: In this short non-fiction piece, the author elucidates some of the more intangible aspects of the BMX lifestyle and its culture including why someone would chose to ride a BMX bike and how it drives those who do so to act in ways many may be seen as strange, nonsensical, or simply reckless. 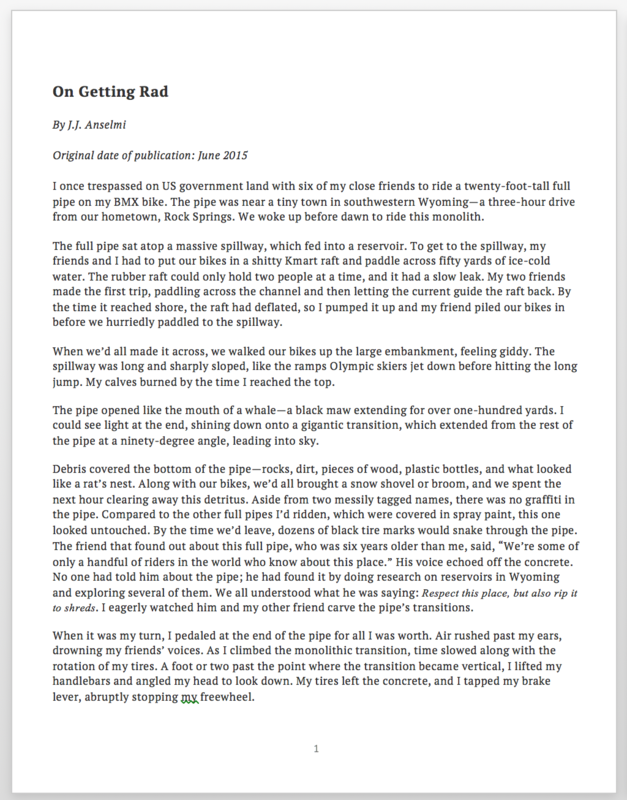 From a description of the complex and unique feelings BMX nurtures to a discussion of how animals on this planet "play" for various reasons, this piece connects the oft overly-emphasized "daredevil" aspects of BMX to its rich mosaic of metaphysical aspects. Synopsis: Sponsorships in BMX are an enigmatic affair. Though deeply interwoven in BMX culture, they are often unexplained and misunderstood. Many people deliver benign yet cryptic talking points when asked about them, but this does no one any favors. This open letter is for all within BMX, the young and new as well as the old and seasoned. 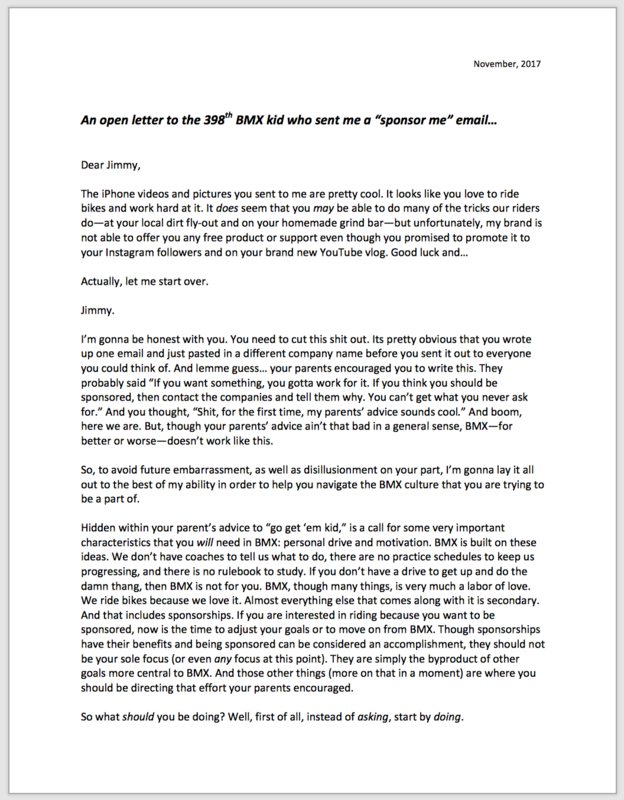 Its says what should be said to make clear what needs to be clear regarding sponsorships in BMX. Synopsis: The third issue of the Culture in Flux series lays out a defense of the BMX Industry and its institutions. It closes with clear calls to action designed to help steer BMX towards positive growth and future longevity within the bounds of our ​"freestyle identity." 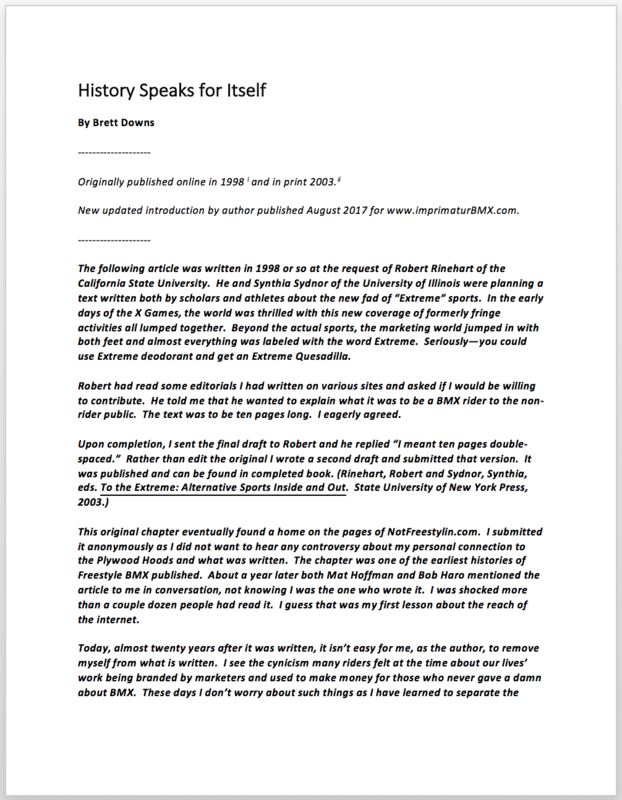 Editor's Note: This is one of the first opportunities for imprimaturBMX to serve as a repository for primary source documents related to BMX culture. Lost in the recesses of the web until now, this piece illuminates an important segment of BMX history--the birth of the "Midschool Period"--as told from the perspective of someone present prior to and during that period. Synopsis: The second issue of the Culture in Flux series continues examining the changing landscape of BMX culture, particularly in regards to the identity of BMX itself. The author argues that identity is an important guiding force in BMX, but bigger issues are hidden below the surface of conflicts prevalent in BMX at the moment; namely, the relationship between riders and the industry and its related institutions. 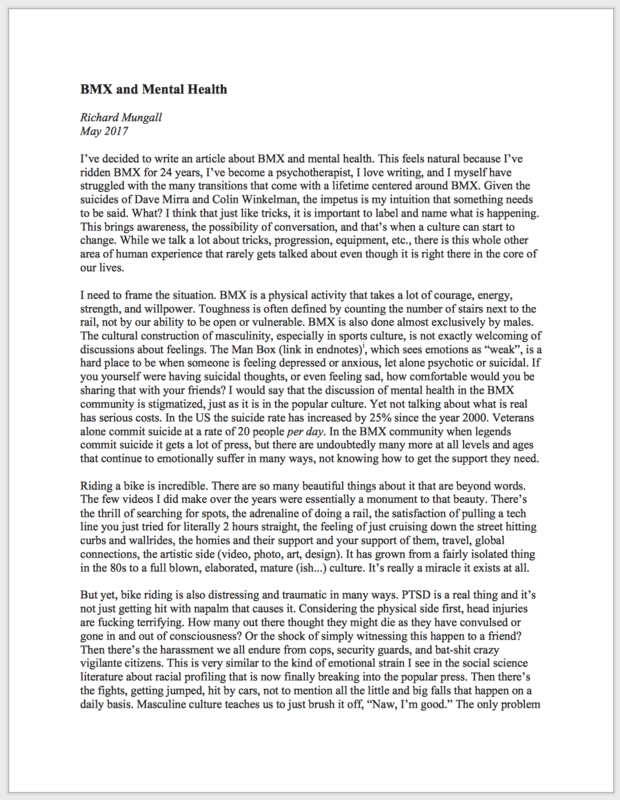 Synopsis: The author combines personal and professional experience as a BMX rider and mental health care professional to call for a reexamination of the ways BMXers look at and deal with emotional issues. Specifically, trauma is the root cause of things ranging from basic emotional distress to suicide and we as BMXers need to understand that we are constantly surrounded by unique trauma that puts us at risk for various types of life issues. 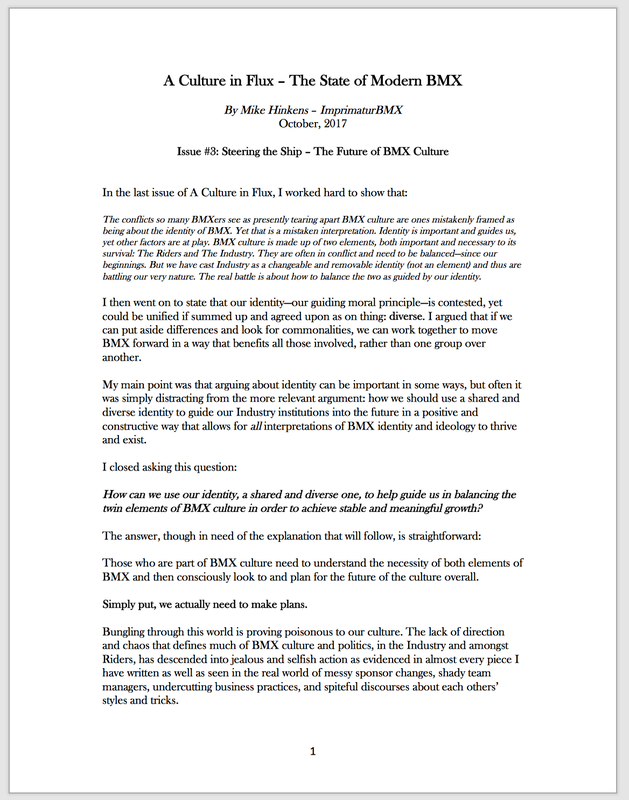 Synopsis: The first installment of Mike Hinkens' Culture in Flux series that attempts to examine some of the major changes occurring in modern BMX. 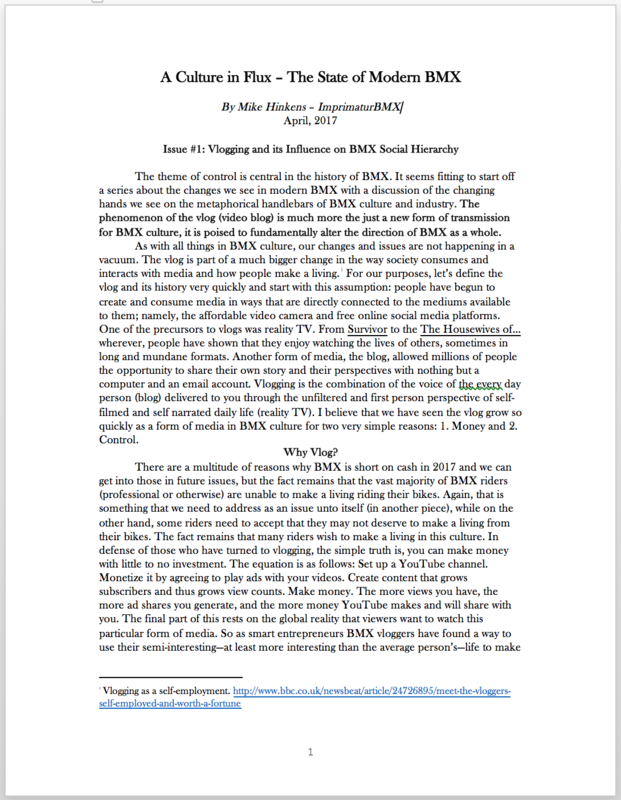 In this issue, Mike discusses the phenomenon of vlogging and its broader implications for the future structure and direction of BMX culture and its associated industry. Editor Mike Hinkens and BMX icon and industry insider Matt Coplon discuss some of the main ideas of the original CIF #1. Matt is certainly no "yes-man" and openly and honestly shares ihis insightful and informed ideas about various topics connected to the piece. Page to the bottom for link to podcast. 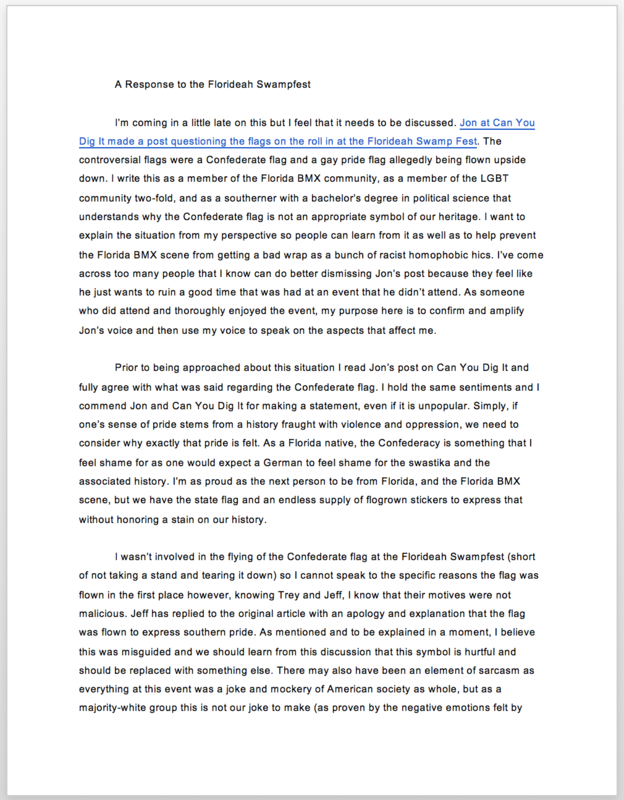 Synopsis: Chelsea Fietsgodin returns to discuss the implications of Confederate and Gay Pride flags flown "ironically" at a major BMX event (Florideah Swampfest). This article discusses those issues as well as responds to another article written regarding this topic at the site CanYouDigIt. Synopsis: A new contributor to the site, Chelsea Fietsgodin brings a humorous approach to a serious phenomenon seen in all cultures, yet especially relevant in the media heavy world of BMX. This piece is a quick read discussing the presence of "micro-aggressions" and the underlying assumptions regarding judgement in the BMX community. ​Synopsis: The final installment of Pat Fisher’s Foundations of Style approaches the intersection of the terrains we ride and the issue of originality in BMX. The article begins with an argument that—though the terrain we ride does affect how we ride—our concepts of what constitutes accepted “riding styles” affect how we interpret and utilize the spots we find in the world. Pat continues to say that our natural human habit of organizing and utilizing the massive and complex world around us can infringe upon creative thinking and thus creativity in BMX itself. Finally, to round out the piece and the series as a whole, Pat concludes with a summary of the whole series and a restatement of its major themes. Scroll to bottom after the jump to listen. ​Synopsis: The fourth installment of Pat Fisher’s Foundations of Style begins with a discussion of the relationship between one of the most obvious parts of BMX—our bikes— and originality and creativity in modern BMX culture. It then analyzes a very relevant and illuminating example of modern bicycle creativity and its unique lessons. 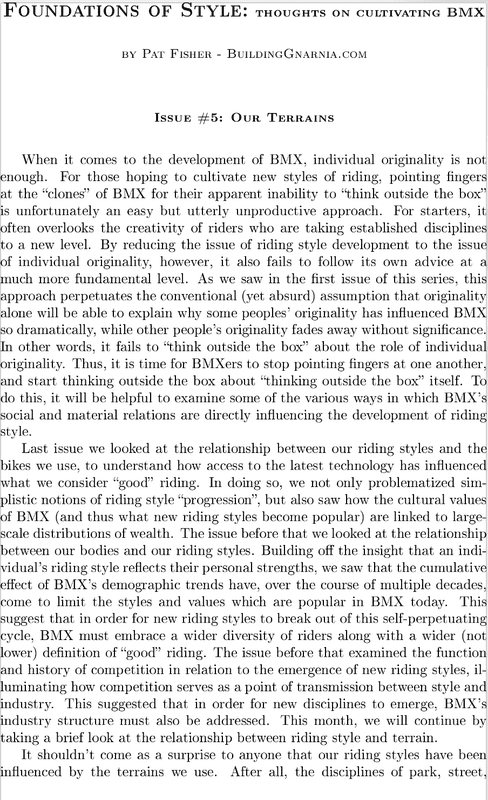 From the micro-perspective regarding technological innovations riders have helped generate, to the macro-perspective concerning global economic inequalities, this piece makes a clear connection between style/originality and some very real and recognizable BMX and global issues. ​Synopsis: For the third installment of Pat Fisher’s Foundations of Style, we dive into the issue of the body and its connection to creativity, or the stagnation of creativity, in BMX. Though ideas regarding gender are evolving in the world at-large as well as in BMX, there is much to be unpacked and discussed when it comes to this important and dominant way of categorizing and organizing society and its cultural subsets, i.e. BMX. In this well-cited and very direct piece, Pat argues that creativity can thrive only if we recognize that we have narrowed the definition of BMX unnecessarily by unofficially mandating the youthful male body as the only tool by which BMX should be practiced. This piece concludes with a series of tips for evolving BMX and our interpersonal relations in hopes of cultivating a more inclusive, open, and creative community. ​Synopsis: In the second installment of Pat Fisher’s series Foundations of Style, it is argued that the BMX industry and the community at-large should embrace new styles of BMX in order for creativity to thrive. This piece focuses on the intersection of competitions (and those orchestrating them) and creative bike riding. According to the author, that relationship plays a strong role in the development of, and often stifling of, creativity in BMX. This piece addresses various notable contentions such as the oft-lamented issue of how to organize and judge various riding styles in formal competition as well as what defines a discipline in BMX. In addition, it integrates a historical perspective on why BMX competitions exist as they do today. ​Synopsis: This is the short, yet dense, introductory piece of Pat Fisher’s series: Foundations of Style. 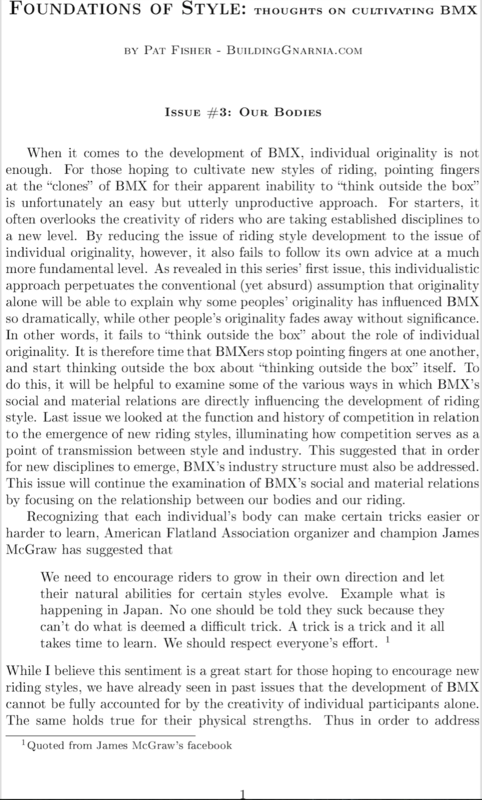 In less than three pages, Pat asserts that the commonly heard complaint about “lack of originality” in BMX riding is symptomatic of bigger issues about how we understand BMX and its relationships with itself, its participants, and its materials. According to him, underlying the “stagnation” seen in modern BMX, is a failed attempt to “think outside the box about ‘thinking outside the box.’” By the conclusion, he lays the groundwork for his upcoming written roadmap for a more open and creative BMX world. 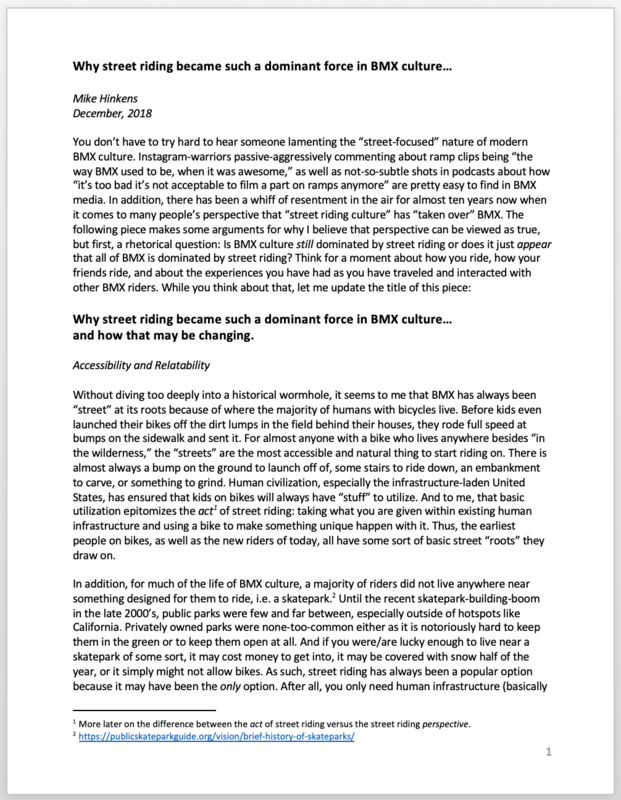 ​Synopsis: The second half of a piece arguing that specialization and diversification of riding styles are neither new, nor indicative of a problem in BMX culture as a whole, but rather a natural, historical, and beneficial phenomena. Those who call for a return to the "way things used to be" have a misunderstanding of the history of BMX culture as seen in their call for the return of the mythical "all-around" rider. 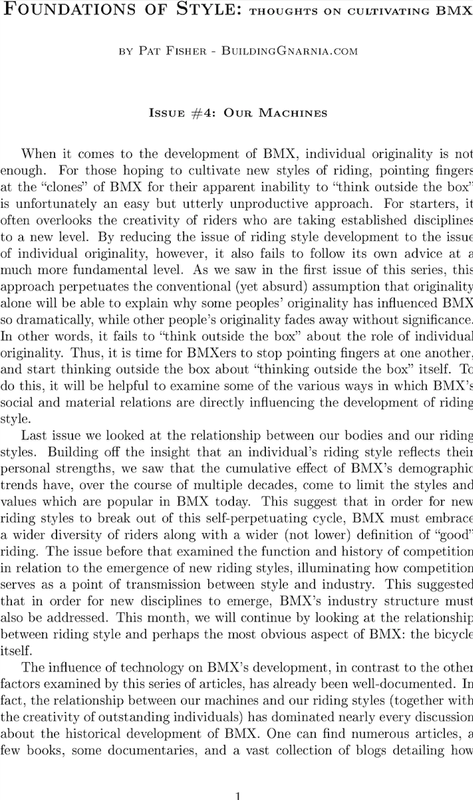 ​Synopsis: Specialization and diversification of riding styles are neither new, nor indicative of a problem in BMX culture as a whole, but rather a natural, historical, and beneficial phenomena. Those who call for a return to the "way things used to be" have a misunderstanding of the history of BMX culture as seen in their call for the return of the mythical "all-around" rider. ​Synopsis: Before any person or company will invest in someone, that rider must invest in themselves. BMXers in 2016 may have the misconception that being of a certain skill level or having a sponsor is why their favorite rider gets to travel or film a banger video part. This written piece serves to show how certain riders use a DIY attitude and their available resources to do all those things without a paying sponsor and why a rider should do all these things to become more desirable to a sponsor. 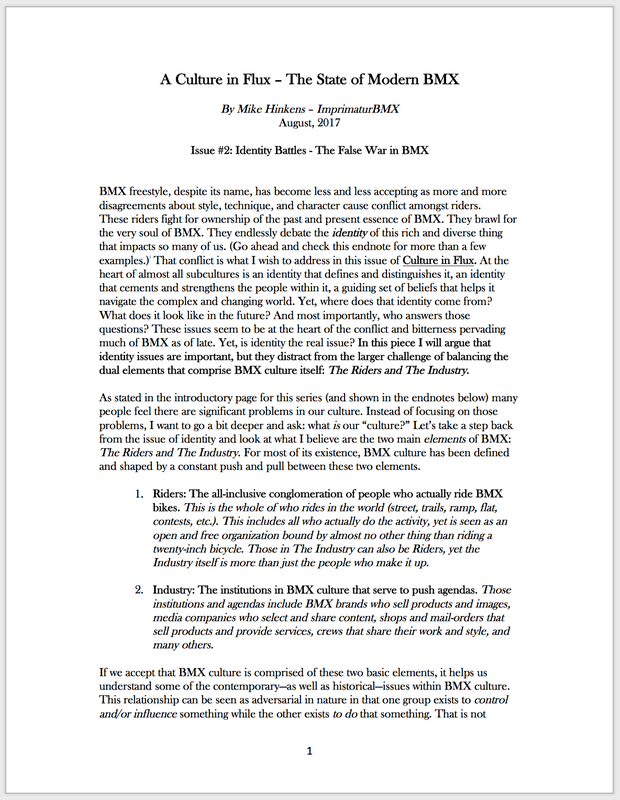 ​Synopsis: This piece is an argument for the cultivation of comprehensive, straightforward, and lengthy written media within modern BMX culture. The author attempts to demonstrate that the extensive documentation of BMX culture that presently exists is impressively thorough, yet there continues to be content and topics which are either ignored or not treated with the depth they warrant. 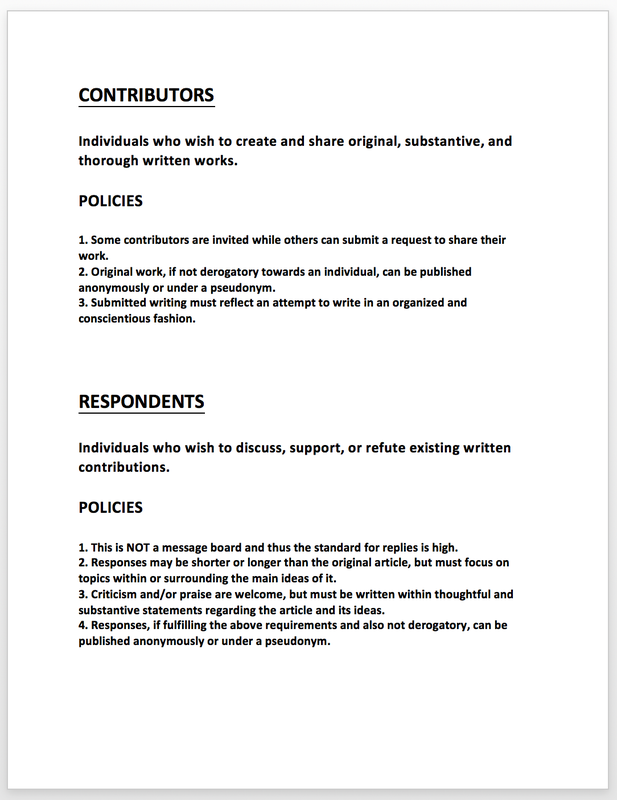 Synopsis: This is where the summary of your article would be. 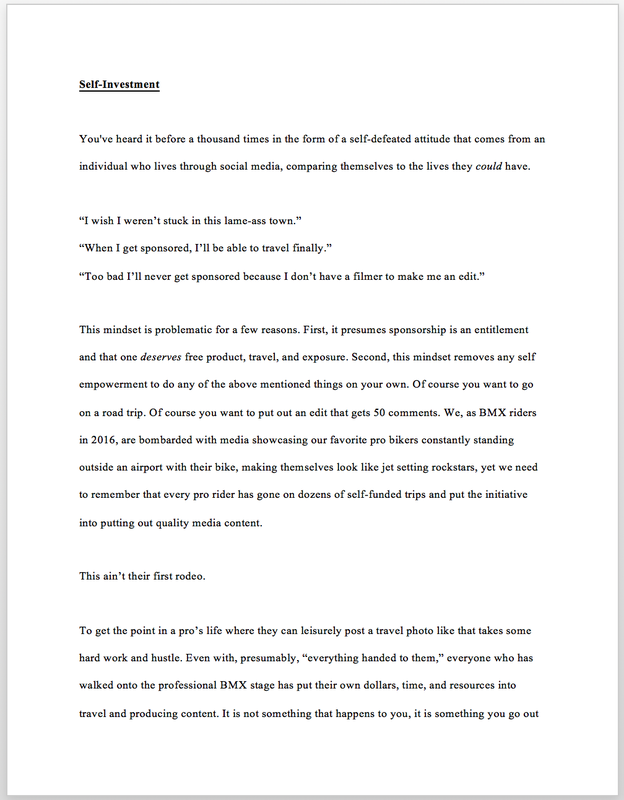 With the multitudes of topics about BMX culture that exist, your article can be about whatever interests you the most. Write it and submit it now.